Ray told me a lot of wonderful stories about his experiences with horses. He also leant the museum his brother�s saddle, as well as his own pair of chaps for the display. When he told me about the pair of chaps he made, I was blown away. I�m going to attempt to retell Ray�s story. In 1949, when Ray was in a teenager, he started working for Lloyd Gilroy, who owned Soda Creek Ranch. 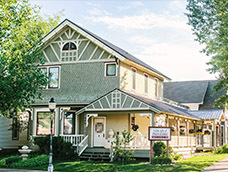 The ranch encompassed all the land behind the Routt Memorial hospital, to Perry-Mansfield, over to Elk River Farm and Feed, up to the Cemetery and over Copper Ridge. Ray was the only employee, and it was his job to tend the fences and livestock. He�d head out early in the morning and come back to town just before dark, or often he�d be too far out and just spend the night under the stars. With so much time in the saddle and riding through thick brush, Ray needed a pair of chaps. Since the Heid family lived in Steamboat Springs, Ray was quick to remind me that he was a �city kid� first. His parents owned and operated the Boys Market, a grocery and supply store, once located on the corner of 9th and Lincoln. Ray�s neighbor in town, Uintah Railey was a Ute Indian, and Ray copied Unitah�s father�s chaps in order to make a pair for himself. With copy and measurements in hand, Ray went to Harwigs Saddlery and ordered a split cow hide which was shipped in from Denver. As he set about putting together the chaps, he noticed the brand, clear as day on the underside of the hide. 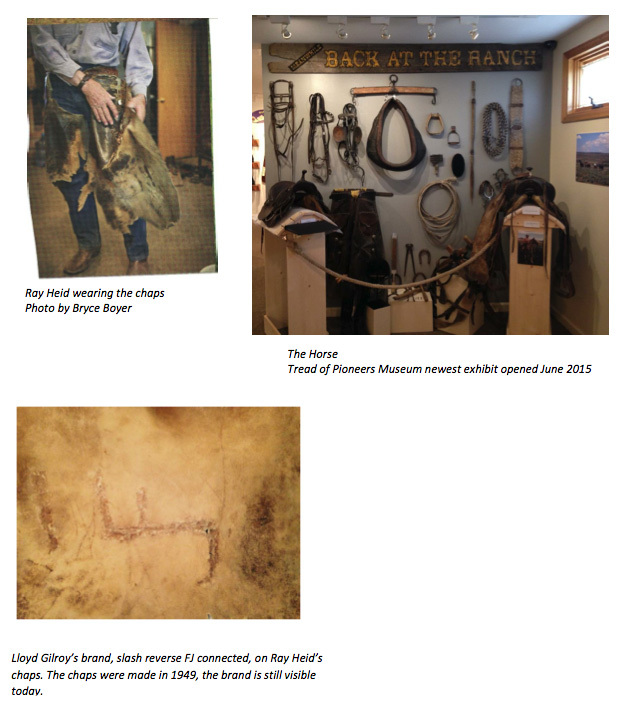 The leather was from none other than Ray�s employer, Lloyd Gilroy! Mr. Gilroy�s cows had been sold, shipped from Steamboat to Denver, processed, the hide saved and tanned, and then one hide was shipped back to Steamboat to fill Ray�s order. How was it possible that out of the thousands of cattle from all over Routt County and Colorado, Ray ended up with this hide? As soon as Mr. Gilroy saw Ray�s new chaps, he asked about them and Ray explained that he made the chaps and ordered the leather from Harwigs, and no, he hadn�t stolen one of Mr. Gilroy�s cows to make the chaps, even though that�s how it looked. Ray produced the Harwigs receipt to prove it. In the end, Mr. Gilroy believed Ray and they all got a good laugh out of the coincidence. Ray wore the chaps for decades, making small repairs as needed. The brand is still visible on the chaps today. You can hear stories like this first hand from Ray. Ray leads daily horseback rides for Del�s Triangle 3 Ranch in Clark. (www.steamboathorses.com). 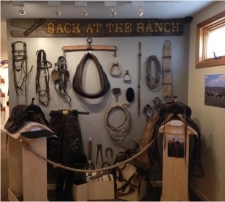 Come and see Ray�s chaps, as well as many other horse items, in our new exhibit, The Horse, which will be on display until May 2016. A big thank you to Ray Heid and all the horse lovers who helped me compile and build The Horse exhibit.